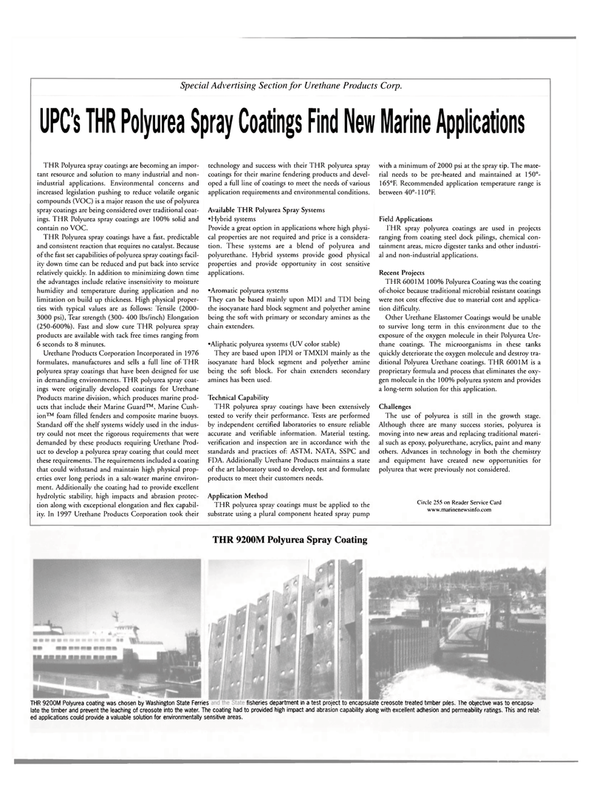 Special Advertising Section for Urethane Products Corp.
THR Polyurea spray coatings are becoming an impor- tant resource and solution to many industrial and non- industrial applications. Environmental concerns and increased legislation pushing to reduce volatile organic compounds (VOC) is a major reason the use of polyurea spray coatings are being considered over traditional coat- ings. THR Polyurea spray coatings are 100% solid and contain no VOC. THR Polyurea spray coatings have a fast, predictable and consistent reaction that requires no catalyst. Because of the fast set capabilities of polyurea spray coatings facil- ity down time can be reduced and put back into service relatively quickly. In addition to minimizing down time the advantages include relative insensitivity to moisture humidity and temperature during application and no limitation on build up thickness. High physical proper- ties with typical values are as follows: Tensile (2000- 3000 psi), Tear strength (300- 400 lbs/inch) Elongation (250-600%). Fast and slow cure THR polyurea spray products are available with tack free times ranging from 6 seconds to 8 minutes. Products marine division, which produces marine prod- ucts that include their Marine Guard™, Marine Cush- ion™ foam filled fenders and composite marine buoys. Standard off the shelf systems widely used in the indus- try could not meet the rigorous requirements that were demanded by these products requiring Urethane Prod- uct to develop a polyurea spray coating that could meet these requirements. The requirements included a coating that could withstand and maintain high physical prop- erties over long periods in a salt-water marine environ- ment. Additionally the coating had to provide excellent hydrolytic stability, high impacts and abrasion protec- tion along with exceptional elongation and flex capabil- ity. In 1997 Urethane Products Corporation took their technology and success with their THR polyurea spray coatings for their marine fendering products and devel- oped a full line of coatings to meet the needs of various application requirements and environmental conditions. They are based upon IPDI or TMXDI mainly as the isocyanate hard block segment and polyether amine being the soft block. For chain extenders secondary amines has been used. FDA. Additionally Urethane Products maintains a state of the art laboratory used to develop, test and formulate products to meet their customers needs. THR polyurea spray coatings must be applied to the substrate using a plural component heated spray pump with a minimum of 2000 psi at the spray tip. The mate- rial needs to be pre-heated and maintained at 150°- 165°F. Recommended application temperature range is between 40°-110°F. I HR spray polyurea coatings are used in projects ranging from coating steel dock pilings, chemical con- tainment areas, micro digester tanks and other industri- al and non-industrial applications. THR 6001M 100% Polyurea Coating was the coating of choice because traditional microbial resistant coatings were not cost effective due to material cost and applica- tion difficulty. Other Urethane Elastomer Coatings would be unable to survive long term in this environment due to the exposure of the oxygen molecule in their Polyurea Ure- thane coatings. The microorganisms in these tanks quickly deteriorate the oxygen molecule and destroy tra- ditional Polyurea Urethane coatings. THR 6001M is a proprietary formula and process that eliminates the oxy- gen molecule in the 100% polyurea system and provides a long-term solution for this application. The use of polyurea is still in the growth stage. Although there are many success stories, polyurea is moving into new areas and replacing traditional materi- al such as epoxy, polyurethane, acrylics, paint and many others. Advances in technology in both the chemistry and equipment have created new opportunities for polyurea that were previously not considered. THR 9200M Polyurea coating was chosen by Washington State Ferries fisheries department in a test project to encapsulate creosote treated timber piles. The objective was to encapsu- late the timber and prevent the leaching of creosote into the water. The coating had to provided high impact and abrasion capability along with excellent adhesion and permeability ratings. This and relat- ed applications could provide a valuable solution for environmentally sensitive areas.